Sometimes the unlikeliest friends form the greatest friendships. A funny, charming picture book from a dynamic duo. Friends Yak and Dove are complete opposites. Yak is large and Dove is small. Yak has fur and Dove has feathers. Yak is polite. Dove is ill-mannered. Yak likes quiet. Dove likes noise. One day as Yak and Dove list their differences they come to the conclusion that maybe they aren't meant to be friends. In the hope of finding a new best friend, Yak holds auditions. But when a small feathered contestant sings Yak's favorite song, the two begin to think that maybe they are alike after all . 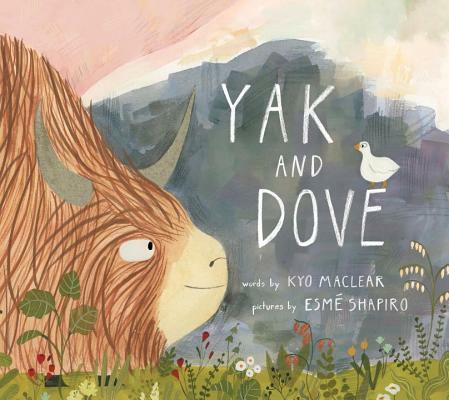 . .
Yak and Dove whimsically captures the highs and lows of friendship through the three interconnected tales of two very different friends. KYO MACLEAR is a critically acclaimed, award-winning author for big people and little people. Her most recent picture books for children include The Liszts, The Wish Tree, The Good Little Book (which was shortlisted for the Governor General's Award) and Julia, Child. The Letter Opener, her first novel for adults, won the K.M. Hunter Artists Award and was shortlisted for the Amazon.ca Books in Canada First Novel Award. Her follow-up novel, Stray Love, appeared on several notable "Best of 2012" lists. Kyo's newest book for adults, Birds Art Life: A Field Guide to the Small and Significant, will be published in January 2017. She lives in Toronto with singer and composer David Wall and their two children. ESMÉ SHAPIRO is the author and illustrator of Ooko, her picture book debut and a finalist for the prestigious Governor General's Award. She grew up in Laurel Canyon, California and Ontario, Canada. Currently she and her dog, Chebini Brown, split their time between Brooklyn and New York's Hudson Valley. A graduate of The Rhode Island School of Design, Esmé is a past recipient of both the Nancy Lee Rhodes Roberts Scholarship and The SILA West 53 Gold Award-Phillip Hayes Scholarship. She has exhibited at The Society of Illustrators and her work has been featured in Taproot and Plansponsor magazines. This is her second picture book. Connect with her online at esmeshapiroillustration.com, on twitter and Instagram @esmeshapiro.